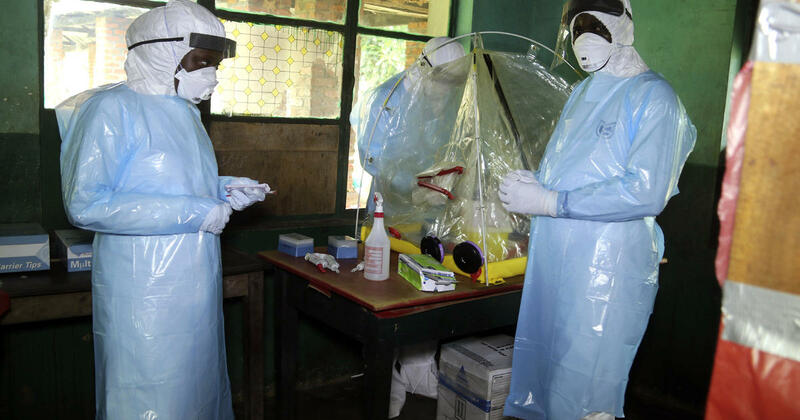 KINSHASA, Congo – Another person died in the Congo from a confirmed case of Ebola, with the number of deaths since the recent outbreak rising to 12, the country's ministry of health said on Sunday. The death occurred in Iboko, a rural area in the northwestern province of Equateur, the Ministry of Health said in a statement. There are also four new suspected cases in the province, the statement said. Shown in this photo On Sunday, May 13, 2018, healthcare workers at a treatment center in Bikoro, Democratic Republic of the Congo, wear protective equipment against viruses. The next few weeks will determine whether the outbreak, announced in May, can be brought under control, according to the World Health Organization. Aggravating factors include the spread to a large city, the involvement of health workers and the existence of three or four "separate epicentres", making it difficult to find and monitor the contacts of infected people.